The Wadsworth Atheneum is the oldest public art museum in the United States, and famously boasts the largest collection of paintings of the Hudson River School, a mid-19th century American landscape art movement influenced by Romanticism. These fine paintings, originally obtained by Daniel Wadsworth, are now considered American masterpieces. 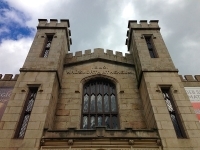 The Wadsworth Atheneum now houses over 50,000 works of art ranging from the ancient to the contemporary, and the building itself is fascinating. The museum also hosts excellent temporary exhibitions and special events like lectures and seminars. Opening times: Wednesday to Friday 11am-5pm; Saturday to Sunday 10am-5pm. Closed Monday and Tuesday. Admission: $15 adults, free for children. Other concessions available.